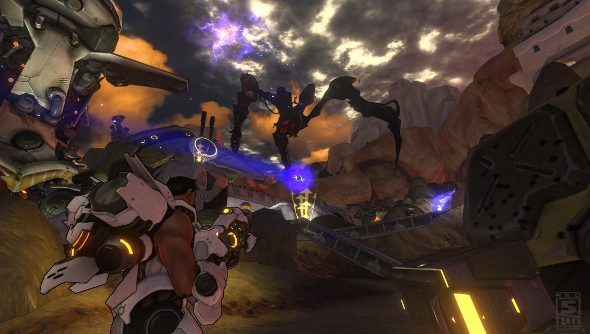 After a long and tumultuous development, Firefall is finally gearing up for launch on July 29th, three years after the initial release window. The jetpacks and mining MMO had quite the bumpy ride, with developer Red 5 making massive sweeping changes well into development, shutting down PvP, letting go of staff and even sacking the CEO. The launch date has come out of the blue, after Red 5 went quiet for most of the year. CEO James Macauley said, in an interview with Polygon, that the developer made a “conscious decision” to go silent so it could knuckle down to deliver the game it wanted to. I played last year, just before it went into open beta, for a preview I was working on prior to being consumed by the PCGN overmind. I had a rather jolly time, jetpacking around a tropical, distinctly alien (but still on Earth) beach resort with a chum. We fought bugs, used gargantuan thumpers dropped from the sky to mine for resources – on one occasion, my thumper landed on me and squashed me dead – and defended or besieged bases ridden with enemy beasties. There’s also a strong focus on crafting, driving the resource gathering game. It’s significantly deeper than contemporary crafting features, but requires some patience and can be quite the time sink. New to the launch version is a brand spanking new continent, just for PvP shenanigans. It’s not been seen in the beta, so it’ll be a bit of a surprise for everyone. Players can go there at any time, but the focus will be on max level PvP based on capturing and controlling territory, bases and resources. After a year of absence, I think I’m going to have to jump back in. It’s free-to-play, so you’ll be able to do the same come July 29th with little fuss.